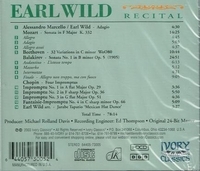 "All newly recorded repertoire for Earl Wild, perhaps one of the most important recordings ever produced. 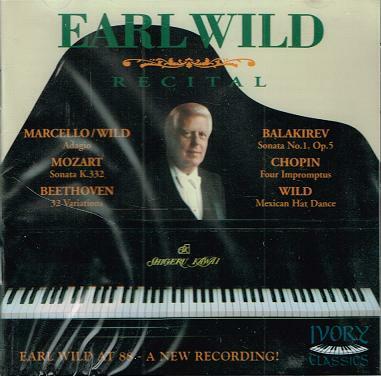 Truly superb performances of Mozart's Sonata K.332; Beethoven's 32 Variations on an original theme; the four Chopin Impromptus and the extremely difficult and rarely performed and recorded Balakirev Piano Sonata #1. 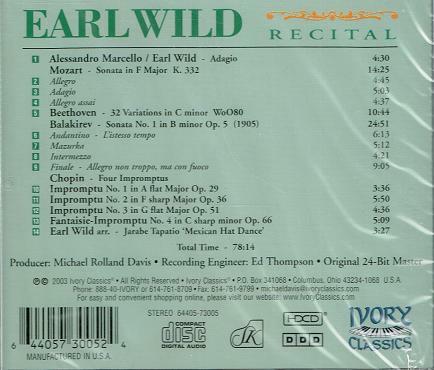 There has never been anything like Mr. Wild's arrangement of the MEXICAN HAT DANCE! Extraordinary 24/88.2 High Definition recording HDCD encoded. Spectacular sound using the new limited edition Shigeru Kawai EX Concert Grand piano."